Disfruta de nuestras ofertas especiales y reservar en el mejor precio! Las mejores tarifas en línea garantizada! 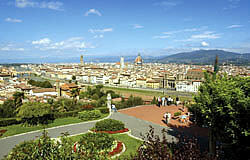 To all our guests we offer a free booking service for Museums and Tours in Florence and most important Tuscan cities. The Tour booking service is guaranteed by the best operator in the industry, while for the Museums we make the free reservation and you will pay directly to the museum the cost of ticket including their booking fee of 4 EUR. To book a tour or a museum ticket contact us by e-mail or ask for a catalog at your arrival at B & B. The tour begins with the discovery of the amazing view of the city from Piazzale Michelangelo, where you can have a complete view of the city of Florence and the green landscape that surrounds it. The tour will go down in the heart of Florence through the historic streets of the city visiting the Accademia Gallery, where you could go see the David of Michelangelo, and continue until you reach the Duomo, where the guide will show outside the Bell Tower, the Baptistery. The tour starts with a visit to Piazza Santa Croce and the the homonymous Basilica, continue to the beautiful Piazza Signoria, where is the impressive Municipal Palace "Palazzo Vecchio" and the famous statues of the Loggia dei Lanzi. 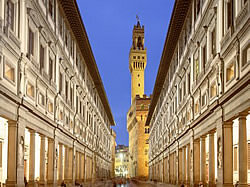 The guide will reserve the last part of the visit of the many masterpieces in the Uffizi Gallery. 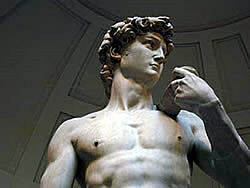 With this tour you will admire the David, one of the most beautiful and famous statues in the world. Inside the gallery you will discover many other masterpieces by Michelangelo. Included: Accademia Gallery guide, ticket and reservation. A whole afternoon of relax immersed in one of the most picturesque areas of Tuscany famous in the world for its charming olive groves alternating with vineyards, where he lives the excellent Chianti Classico wine production, and Extra Virgin Olive Oil. 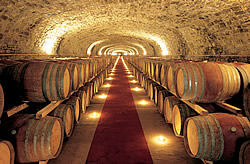 Will visit an ancient village Greve in Chianti and also a farm of the most renowned area of Chianti wine tasting. 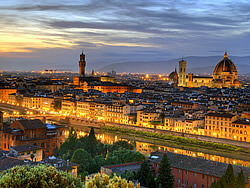 A full day immersed in art, to discover the monuments of Florence and its beautiful landscapes. The tour begins with the discovery of the magnificent view of the city from Piazzale Michelangelo, where you can have a complete panorama of the city of Florence and the green landscape that surrounds it. The tour will go down in the heart of Florence through the historic streets of the city visiting the Accademia Gallery, where you could go see the David by Michelangelo, and continue until you reach the Duomo, where the guide will show outside the Bell Tower, the Baptistery. Finally know the famous and delicious Tuscan cuisine with a lunch based on local dishes. A splendid excursion through the city that was one of the “Old Republic Marinare”. 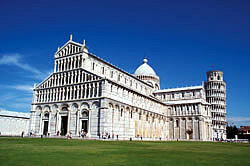 Upon arrival in Pisa, guided walking tour to visit a unique panorama of Miracle Square “ Piazza dei Miracoli” with its famous Leaning Tower, Cathedral, Baptistery and the Monumental Graveyard. This is followed by a visit to the interior of the Cathedral and Baptistery. Included in the price Pick-up in B&B, Bus, Cathedral & Baptistery tickets. The tour starts with the bus through one of the most picturesque areas of Tuscany "Chianti" known in the world for its excellent wine and for its unique charm. 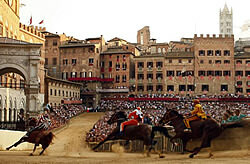 Once in Siena, will begin a tour through its little street and narrow boulevards to the heart of the city, you admire the spectacular “Piazza del Campo”, theater of the famous Palio race, with the Palazzo Pubblico, the Torre del Mangia, the Duomo, also visited the interior and the Piccolomini Library and the adjacent Museo dell'Opera del Duomo. The trip continues to San Gimignano, a small ancient medieval town which has remained intact, famous for its numerous towers, declared by the Unescu “Heritage of Humanity". Shuttle out of Florence town by private coach. 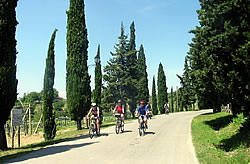 Pedal through a landscape of cypress trees, olive groves, and rustic farms, exploring the vine-covered hills south of Florence. Visit a Tuscan hill town, tour a winery (with wine tasting ), and stop for lunch at country restaurant. On this course you have the opportunity to learn important secrets of traditional tuscan cuisine. You create a authentic tuscan dishes ( from the appetizer to the dessert ) helped by a qualified staff. Classes start going to a walk to a typical Florentine market (San lorenzo Market) where walking through the picturesque stands and you choose the fresh ingredients to cook. The course will be followed by lunch savouring the fruits of your work accompanied by a good Tuscan wine. 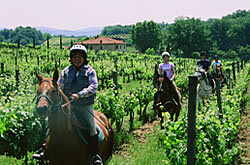 With this tour you can explore the Tuscan countryside in a most delightful way... on horseback! The tour leaves daily from opposite the central train station of Florence and you will be taken to the Chianti region known in the world for its excellent wine and for its unique charm. You ride through lush vineyards, native woods, olive groves and rolling hills to offer you a collection of breathtaking and unforgettable views. 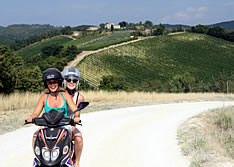 You can ride four hours with Vespa scooter visiting different small medieval villages in the heart of Chianti area along scenic and silent country roads through the hillsides of Tuscany. con vistas a la ciudad.